Plot – During the upheaval of 1960’s American, husband and wife Swede and Dawn Levov (McGregor and Connelly) struggle to maintain their day to day lives after their rebellious and politically radical daughter Merry (Fanning) is accused of a violent crime. 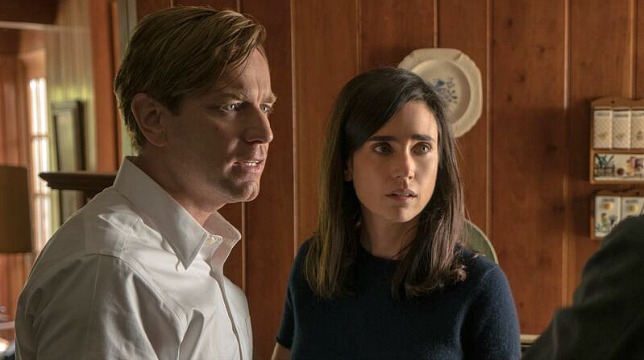 Based on late author Philip Roth’s 1997 Pulitzer Prize winning novel of the same name, American Pastoral see’s the seemingly never ceasing to work Ewan McGregor step behind the camera for the first time to adapt Roth’s supposedly unadaptable book for the big screen. Only recently finding its way to the Australian marketplace after premiering at the Toronto International Film Festival way back in September of 2016, Pastoral see’s McGregor trying valiantly to bring Roth’s revered work to life for the big screen treatment but it’s to little avail as McGregor’s well-intentioned work behind and in front of the camera as lead character Swede Levov amount to little in an adaptation that loses sight of what made Roth’s work a member Time magazine’s list of 100 best novels. Famous for its dealings around the social and political unrests of the 1960’s and 1970’s American landscape, Roth’s family drama centring around Swede and Jennifer Connelly’s wife Dawn idealistic world being shattered by their stuttering daughter Merry (played well by Dakota Fanning) being implicated in a violent act of political terrorism, Pastoral’s finer nuances and themes have been lost by Mcgregor and screenwriter John Romano as this unbalanced feature becomes more of a tale of a father looking for his missing daughter. Many naysayers to a cinematic adaptation of Roth’s work felt for year’s that the novels layered and complicated foundation would struggle to be brought to life on the big screen and there’s little doubt as to why so many various behind the scenes players and actors have come and gone on this project before McGregor decided to take matters into his own hands. While the film itself is a notable failure and fans of Roth’s work are likely to be left cold by this experience, there are brief glimpses on show here that would suggest McGregor should try his hand once more at the directing game, with the period detail and atmosphere created by the well-liked actor a highlight of the film that otherwise leaves much to be desired, especially in its cinematic treatment of much of Roth’s dialogue that comes across here as both stale and stilted rather than full of life. Some books are unfortunately better left untouched for the big screen treatment, with American Pastoral one of these. Despite good intentions from all involved, including a trying very hard McGregor, this is an adaptation you’re best off avoiding.